No. 20 Lions defeat Angelo State 3-1 to earn first NCAA Playoff win since 1988, advances to semis. STEPHENVILLE– The No. 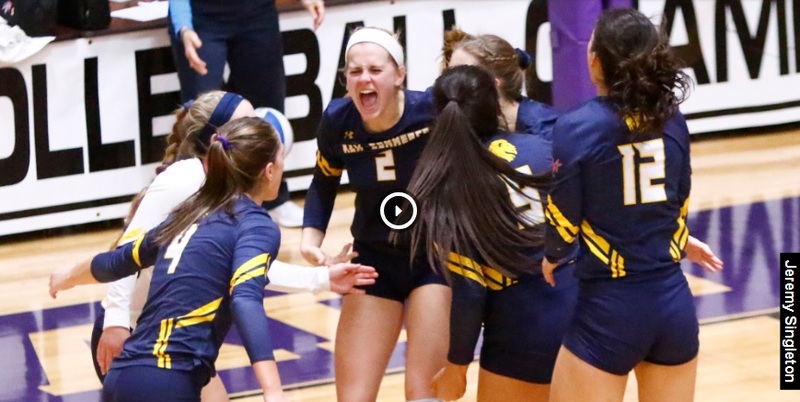 20 Texas A&M University-Commerce volleyball team defeated Angelo State 3-1 in the first round of the NCAA Division II South Central Regional tournament on Thursday. The Lions won the first set and rallied from behind in both the third and fourth sets to get the victory. The set scores were 25-19, 14-25, 25-14 and 25-23. The win brings the Lions to 29-5 on the season, and they advance to the semifinal round. Angelo State falls to 22-10 on the year, and they are eliminated. It is the first NCAA playoff win for A&M-Commerce since the 1988 season. The Lions will face Colorado Mesa, the third seed in the tournament, on Friday at 5:00 p.m. The match will be played at Wisdom Gym in Stephenville. – Celeste Vela (Guadalajara, Mexico) recorded her ninth triple-double of the season with 13 kills, 18 assists, and 11 digs while hitting .296. She led the team in kills and assists. – Jaryn Wacker (Austin – Vista Ridge) hit .300 with 12 kills and had a double-double with 12 digs. – Shelley Chapron (Houston – St. Pius X) had nine kills and four blocks while Bina Njikam (Keller) had five kills and led the team with six blocks. – Jaslyn Wacker (Austin – Vista Ridge) and Madison Luther (Sealy) had four kills apiece. – Rylie Fuentes (Robinson) had a double-double with 17 assists and 14 digs. Savannah Rutledge (The Woodlands – College Park) also had 14 digs in the match. – The win is the Lions’ 12th in a row, their longest winning streak of the season. – The win is the Lions’ first NCAA Playoff since the 1988 season. The Lions struck first and took the lead before the Rambelles scored three in a row to take the lead. The teams began to trade points, with neither gaining more than two points in a row. Midway through the set, the teams were tied at 12. The Lions began a run from there, taking five points in a row to build a three-point lead. The Rambelles cut the Lion lead to one point, but A&M-Commerce finished the set on a 5-1 run to win the game 25-19. The Lions held ASU to a .088 hitting percentage in the set. Six different Lions earned kills in the set. After the teams traded the first four points of the second set, ASU scored four of the next five to build a three-point lead. The Lions battled back with defense, with consecutive blocks from Jaslyn Wacker and Chapron to tie the match at eight. ASU began to take control of the set, scoring four points in a row. The Lions could not stem the tide and fell 25-14. The Lions got off to a quick start in the third set, taking seven of the first 10 points. ASU then went on an 8-1 run to take an 11-8 lead. The Lion offense then exploded, winning 17 of the final 20 points of the set. Vela had four kills in the game. The Lion defense held ASU to a -.167 hitting percentage in the set. ASU took three of the first four points of the set before the Lions tied the game at four. ASU scored four in a row again, but the Lions battled back to tie the set again, this time at 10. After a 3-0 run from ASU, the Lions came back with a 6-0 run of their own to take a 16-13 lead. ASU battled back to tie the match at 19 and then took the lead. The Lions locked in in the final points, winning six of the last seven to win the game in four sets. Vela and Jaryn Wacker each had six kills in the final frame. Jaryn and Jaslyn Wacker named Google Cloud Academic All-District. 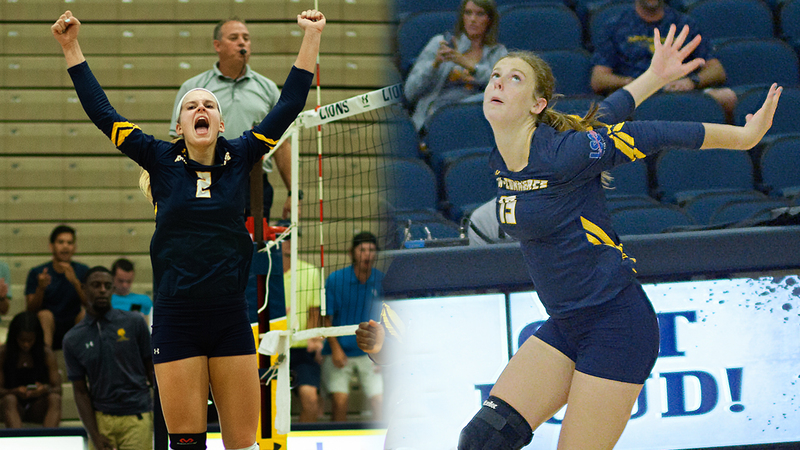 COMMERCE – Texas A&M University-Commerce volleyball standouts Jaryn Wacker and Jaslyn Wacker have been named to the Google Cloud Academic All-District® Team, as announced by the College Sports Information Directors of America (CoSIDA) on Thursday. Jaslyn Wacker is a senior accounting major from Austin (Vista Ridge) and earns Academic All-District honors for the second consecutive season. In 2017, she was named a second-team Academic All-America, becoming the first Academic All-America in Lion Volleyball history. She was also the 2017 Lone Star Conference Academic Player of the Year. She is a four-time all-Lone Star Conference selection, earning first-team honors in 2017, second team honors in 2018 and 2015, and honorable mention in 2016. She was also named second team all-region in 2017. She has 321 kills and 103 blocks this season. She has recorded double-digit kills in 17 matches this season and had 11 games with at least five blocks. She has been named to the President’s List six times and the Best In Class List six times. She has been named to the Lone Star Conference Commissioner’s Honor Roll six times and is a two-time recipient of Division II Athletics Directors Association Academic Achievement Award. Jaryn Wacker is a senior finance and Spanish double major from Austin (Vista Ridge) and earns Academic All-District honors for the second consecutive season. This year she was named second-team all-Lone Star Conference and earned LSC All-Academic honors for the second successive season. She has posted a career-high 327 kills on the season with a career-high hitting percentage, recording double-digit kills in 19 matches this season. She has been named to the President’s List four times, the Dean’s List once, the Best In Class List five times, and the Athletics Director’s List once. She has been named to the Lone Star Conference Commissioner’s Honor Roll six times and is a two-time recipient of Division II Athletics Directors Association Academic Achievement Award. The Wackers and the Lions won the school’s first Lone Star Conference Tournament Championship since 1987 last weekend is the second seed in this weekend’s NCAA Division II South Central Regional Tournament. A&M-Commerce takes on Angelo State at 2:30 p.m. Thursday in the regional quarterfinal round of the tournament. Blubaugh and Martinez named Google Cloud Academic All-District. COMMERCE – Texas A&M University-Commerce linebacker Garrett Blubaugh and kicker Kristov Martinez have been named to the Google Cloud Academic All-District® Team, as announced by the College Sports Information Directors of America (CoSIDA) on Thursday. Blubaugh is a senior biological science major from Keller. He adds Google Cloud Academic All-District honors to a lengthy list of accolades, as he was the 2017 NCAA Division II Football winner of the Elite 90 Award and a semifinalist for the National Football Foundation’s Campbell Trophy. He was named All-Academic by the Lone Star Conference in 2017 and has been named to the Dean’s List once, the President’s List four times, the Best In Class List four times, and the Athletics Director’s List once. He has been named to the Lone Star Conference Commissioner’s Honor Roll six times and is a recipient of Division II Athletics Directors Association Academic Achievement Award. In the 2018 season, he is the Lions’ second-leading tackler with 59 tackles, 5.5 tackles for loss, and 1.5 sacks. Martinez is a graduate student from Edinburg, majoring in secondary education. He earned his bachelor’s degree in December 2017 in business administration. He was named the Lone Star Conference Scholar-Athlete for the 2017-18 academic year and has been named to the Dean’s List twice, the President’s List three times, the Best In Class list four times, and the Athletics Director’s List four times. He has been named to the Lone Star Conference Commissioner’s Honor Roll six times and is a two-time recipient of Division II Athletics Directors Association Academic Achievement Award. On the field, Martinez is 14-for-19 on field goal attempts and 44-for-44 on PAT attempts in 2018. He is now 68-of-90 on field goal attempts in his career, which is tied for second in Division II history. He is the active career leader in Division II in field goals, PATs, and kick scoring. His 424 career points rank third in Lone Star Conference history, only 13 points away from the all-time lead. He has made 99 consecutive PATs entering the Division II playoffs. He was a third-team All-American in 2017 and a finalist for the Mitchell Award. 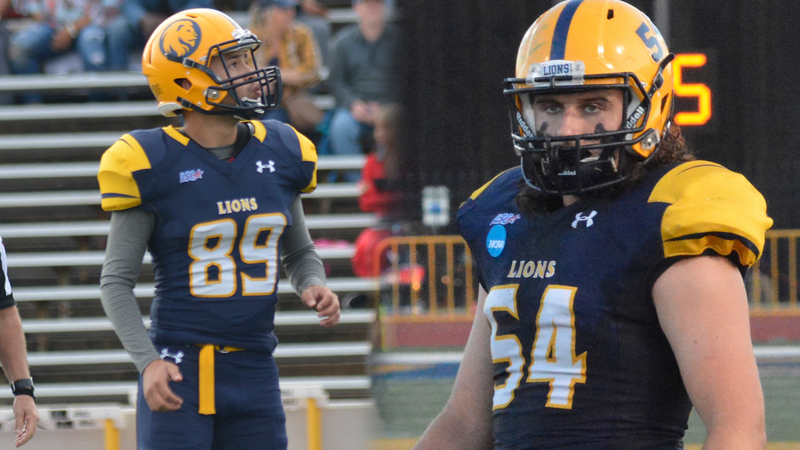 Blubaugh, Martinez, and the Lions travel to Minnesota this weekend for the regional quarterfinal round of the NCAA Division II playoffs. A&M-Commerce is the sixth seed in Super Region Four and kicks off at third-seeded Minnesota-Duluth at 1:00 p.m. Saturday. Lions drop exhibition contest to hot-shooting North Texas. 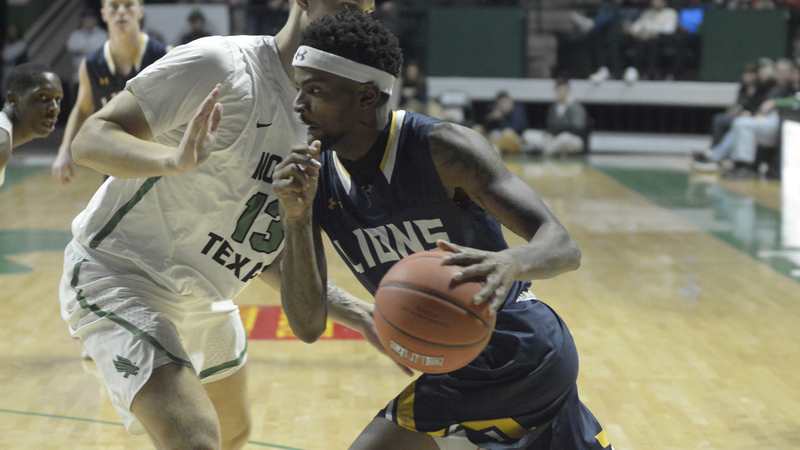 DENTON – The Texas A&M University-Commerce men’s basketball team stepped out of the Division II realm Wednesday night for an exhibition game at the University of North Texas, falling 102-53 in The Super Pit. The Lions’ regular season record remains steady at 3-0 entering this weekend’s action at the Comfort Inn Classic in Gunnison, Colo. A&M-Commerce’s first game in the tournament will be against Colorado Mesa (1-1) at 5:30 p.m. MST (6:30 p.m. CST). 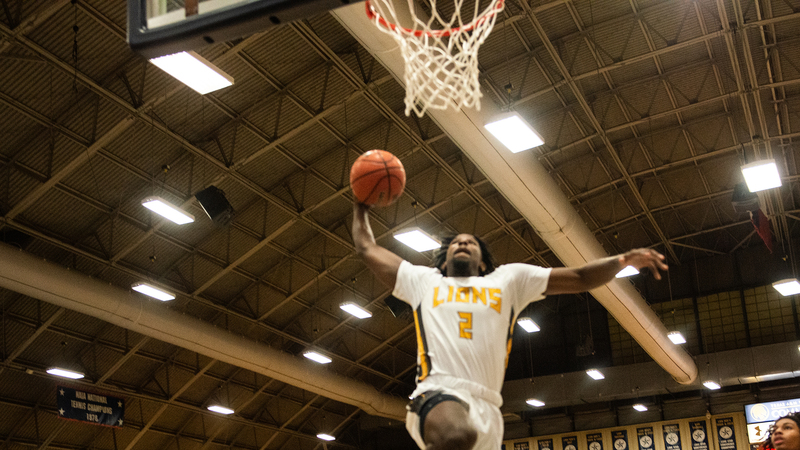 – The Lions were led in scoring by Trey Conrod (Kilgore), who netted 12 points and grabbed 6 rebounds. – Reggie Reid (Harlem, Ga.) scored 10 points in the game, passed out two assists, and grabbed two rebounds. – Tyree Robinson (Fall River, Mass.) led both teams with eight rebounds. He also scored six points. Deonta Terrell (Chicago, Ill.) scored seven points off the bench. The Mean Green started the game off by making the first three shots before Conrod’s layup at the 17:38 mark put the Lions on the board. UNT’s Jorden Duffy had 10 early points to give the hosts the double-digit lead with three minutes gone. Conrod netted the Lions first eight points of the night with contested scores. He and Carson Tuttle (Mukilteo, Wash.) strung together a pair of baskets to cut the lead back down to 17-8. Terrell and Rodney Brown (Beaumont – West Brook) would score three points apiece in the middle of the period. Reid scored five points on consecutive possessions, but the Mean Green’s hot shooting allowed the home team to pull away. The Lions were held off of the scoresheet for the final three and a half minutes, and UNT took a 53-27 lead into the locker room. The Lions shot 35.7 percent (10-of-28) in the first half but made only 2-of-12 three-pointers. North Texas shot 56.3 percent (18-of-32) in half, including 9-of-19 (47.4 percent) on three-pointers. The Lions took the floor with renewed energy in the second half, as Robinson drove for a layup, Reid drained a three-pointer, and Willie Rooks (Houston – North Forest) hit a jumper. The Mean Green then went on a surge to pull away further. Multiple A&M-Commerce players showed toughness in the paint to score in the second half. Conrod, Vernon Lowndes (Charleston, S.C.), and Robinson all scored multiple baskets down the stretch. Lions roll to 111-64 win over Our Lady of the Lake in the home opener. COMMERCE– The Texas A&M University-Commerce men’s basketball team defeated Our Lady of the Lake 111-64 in the Lions’ home opener on Tuesday. A&M-Commerce got out to a quick lead and cruised to their third consecutive victory. The win brings the Lions to 3-0 on the season. The game does not count against the Saints’ record. The Lions return to action on Wednesday with an exhibition game against North Texas. The game will be played at 7:00 p.m. at The Super Pit in Denton. The Lions will then head to Gunnison, Colo. for a tournament beginning Friday. – All 10 Lions who saw action recorded points. A&M-Commerce led by as many as 50 in the game. – Tyree Robinson (Fall River, Mass.) led the Lions with 20 points, going a perfect 9-for-9 from the field. He also had a double-double with 11 rebounds and added three blocks. – Trey Conrod (Kilgore) had 19 points and eight rebounds and added a team-high four steals on the defensive end. – Willie Rooks (Houston – North Forest) had 13 points, and Deonta Terrell (Chicago, Ill.) also had 13 points to go with nine rebounds. Vernon Lowndes (Charleston, S.C.) had 12 points, and Carson Tuttle (Mukilteo, Wash.) also scored in double figures with 10 points and had five assists. – Reggie Reid (Harlem, Ga.) led the team with eight assists. – The Lions shot 52 percent from the field, including shooting 67 percent in the second half. A&M-Commerce scored 64 points in the paint. The Lions opened up the game with a dunk from Conrod, and the Lions did not look back, never trailing in the contest. Conrod scored the first eight points of the match for A&M-Commerce, including two triples. Robinson then had consecutive putback shots to push the Lions ahead even further. The Lions pushed their lead to double digits midway through the half as the Lions scored 15 points in a row, which included three three-pointers. The Lions brought their lead to 30 points by the end of the half. Conrod had 12 points at halftime while Robinson and Terrell each had nine. The Lions continued to have their way in the second half, shooting an out-of-this-world 67 percent in half. Conrod hooked up with Robinson for an alley-oop jam early in the half as the Commerce crowd got to its feet. Lowndes and Tuttle got into the scoring in the second half as the Lions brought in their reserves for some action. Both made threes as the Lions pushed their lead to 40 points with 14 minutes to play in the game. A three-pointer from Tuttle gave the Lions a 100-50 lead, their largest of the game, with five minutes left. The Lions were able to run out the clock for their first home win of the season. No. 15 Lions open fourth straight playoff trip with a trek to No. 5 Minnesota-Duluth. COMMERCE – The No. 15 Texas A&M University-Commerce football team has qualified for the NCAA Division II Playoffs for the fourth consecutive season and will take on undefeated and No. 5 the University of Minnesota-Duluth in the Super Region Four quarterfinal. RECORDS: The Lions are 9-2 overall and went 6-1 in the Lone Star Conference. The Bulldogs went 11-0 in the regular season and are the co-champions of the Northern Sun Intercollegiate Conference. RANKINGS: Texas A&M-Commerce is ranked No. 15 in the AFCA Coaches’ Poll and No. 18 in the D2Football.com Media Poll. UMD is ranked No. 5 in the AFCA Coaches’ Poll and No. 5 in the D2Football.com Media Poll. • With their qualification for their fourth straight NCAA Division II Playoff berth, the Lions have the third-longest active playoff streak in the nation. • Only Northwest Missouri State (15 straight) and Ferris State (five straight) have longer active playoff streaks than A&M-Commerce. • In Lone Star Conference history, only A&M-Kingsville (1992-98, 7 straight) has a streak of more than four appearances. • Don Carthel’s West Texas A&M teams qualified four straight times from 2005-08. • This is the Lions’ seventh all-time NCAA Playoff berth, with an 8-5 record. • Today’s game also marks the Lions’ 24th all-time postseason contest, with A&M-Commerce carrying a record of 15-7-1. • This is the second season the Lone Star and Northern Sun conferences have been paired up in a super-region, and with the size of the NSIC (16 schools), that league no longer plays non-conference games in the regular season. • The Lions are 3-1 all-time against the NSIC. • This includes the wins at Winona State and Minnesota State in the 2017 playoffs. • A&M-Commerce split a home-and-home series with Upper Iowa in 2010 & 2011. • A&M-Commerce won at Memorial Stadium in 2010, 30-10, and was edged by UIU in Fayette in 2011, 15-14. (Current receivers coach Yogi Gallegos passed for 220 yards and two touchdowns in the game). • The Lions’ only other contest against a current NSIC member was in 1991 when ET beat Wayne State (Neb.) 54-16 at Memorial Stadium. The Wildcats were a Division II independent at the time. Head coach Colby Carthel now ranks fifth in A&M-Commerce history in coaching wins with 58 wins. He is now only five wins behind Lion and LSC legend J.V. Sikes, who sits in fourth place with 63 wins. The 2018 senior class has tied for the school record for wins in a four-year period with 42 games won in a four-year span. A win would give this year’s group sole possession of the record. A&M-Commerce has been ranked in 51 consecutive AFCA polls, dating back to the 2015 preseason poll. This is A&M-Commerce’s 57th all-time appearance in the AFCA poll since its inception in 2000. In the polls recognized by Division II as the top rating system, the Lions have been recognized as a nationally ranked team 106 times since joining Division II in 1981. 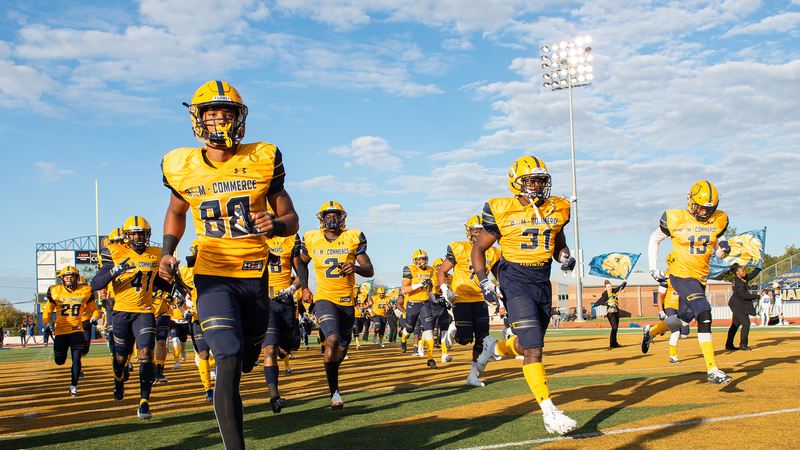 In six home dates, A&M-Commerce drew 45,296 total fans in 2018. That total attendance ranked second in Division II. In terms of average attendance, the Lion faithful turned out at a rate of 7,549 per game. That ranked eighth nationally. Over the last five years (available in the NCAA rankings database), the Lions have nearly doubled their average turnout since the 2013 season. The next closest season since 2009 was over 2,400 fans per game fewer. KickerKristov Martinez scored 11 kicking points with two field goals and five PATs in the win over Angelo State. He is now 68-of-90 on field goal attempts in his career, which is tied for second in Division II history (first place is 82). Martinez is now the record-holder for most career field goals in Lone Star Conference history, eclipsing Sergio Castillo’s 62 career field goals. Martinez is the Division II active career leader in made field goals and tied for third in all NCAA divisions behind LSU’s Cole Tracy (90) and Toledo’s Jameson Vest (70). Martinez is tied with Wisconsin’s Rafael Gaglianone. Martinez is on the preseason, September, and October watch lists for the Mitchell Award. For his career, Martinez has made 220-of-227 PAT attempts and is the Division II active career leader. Oklahoma’s Austin Seibert is the all divisions active career leader with 287 made PATs. Martinez is third in all divisions behind Seibert and North Dakota State’s Cam Pederson (231), and ahead of Ohio State’s Sean Nuernberger (216). In terms of overall scoring, Martinez (424 points) is chasing Castillo (437 points), and former Harlon Hill winner at Texas A&I Johnny Bailey (426 points) for the all-time LSC scoring record. He has been named a second-team preseason All-American by Lindy’s. Martinez was also named LSC All-Academic and A&M-Commerce’s male LSC Scholar-Athlete for 2017-18. Martinez has also connected on 99 straight PATs dating back to the Eastern New Mexico game in week three of 2017. The Lions’ leading tackler in senior Brucks Saathoff is also one of the leaders in the Lone Star Conference. The San Antonio native is averaging 7.7 tackles per game through nine contests, ranking 122nd nationally and 11th in the LSC. For his career, Saathoff has 294 tackles, which is the leading mark for the Lions. This ranks Saathoff in the top five in Lion history in tackles. Lion running back Ovie Urevbuhad his third consecutive and seventh career 100-yard rushing game against Angelo State. He earned LSC Offensive Player of the Week with his performance on his senior day. He had 30 carries for 184 yards in the win, notching touchdown carries of 35 and 15 yards. Urevbu now has 1,514 career yards on 230 carries, averaging 6.4 yards-per-carry for his career. The Lion kicking game has been spectacular during the 2018 season. A&M-Commerce ranks first nationally in kickoff return defense, as Lion opponents average 10.66 yards per return. UMD ranks third nationally in this category, allowing opponents only 13.35 yards per kickoff return. A&M-Commerce ranks No. 31 nationally in net punting. The Lions average 36.5 yards net per punt. Tristan Perry averages 40.2 yards per punt, which is third in the Lone Star Conference and ranks 42nd nationally. This game matches up two of the top defenses in the country. UMD ranks first nationally in total defense, allowing 199.3 yards per game. A&M-Commerce ranks 22nd nationally in total defense at 298.6 yards per game. Lion defensive back Dominique Ramsey had a 99-yard interception return for a touchdown in the third quarter of the win over Angelo State. Ramsey has three interceptions for 226 return yards, averaging 75.3 yards per INT return. This does not include an interception on a two-point conversion attempt in the A&M-Kingsville game, which the NCAA statistics policy does not count as an interception. Ramsey’s interception return yardage leads the nation. The Lions as a team average 47.1 yards per interception return on nine picks. Of the nine interceptions, four have been returned for touchdowns. On top of this, Ramsey ranks 26th nationally and second in the LSC in punt return average, averaging 10.8 yards per punt return. He has seven plays of over 20 yards this season – three punt returns, three interception returns, and a kickoff return. Three of those plays went for touchdowns. His six career interceptions are the most on the team. The Lions held UT Permian Basin to minus-69 rushing yards last week to establish a program single-game record for rush defense. The previous record of minus-48 yards was set against Angelo State in 1992. The Lone Star Conference record of minus-77 yards was set by McMurry against Abilene Christian in 1968. A&M-Commerce had nine sacks and held UTPB running backs to zero cumulative rushing yards. The Falcons did not have a rushing first down. This is the second-fewest rushing yards allowed in a Division II game in the last six seasons. Limestone allowed minus-79 rushing yards against Shaw in 2016. In all four divisions of NCAA football this season, the Lions have the best single-game rushing defense performance. The Lions scored 34 points in the second quarter of the game at Western New Mexico, establishing a school record for points in a quarter. The previous record was 32, which the Lions scored in the second quarter of a 39-39 tie against Angelo State in 1991. This is not just a Willie Nelson reference for coach Carthel, even though he will appreciate it. The 2018 Lions are 5-0 on the road. The 2018 season is the eighth time in program history that the Lions have won five or more true road games, including an 8-1 record away from Commerce in the 2017 National Championship season and a six-win road season in 2016. The Lions also had six road wins in 1951, 1953, and 1980. The Lions had five road wins in 1957 and 1990. Each of those seasons with the exception of 1951 concluded with a postseason appearance. Dec 6, 1980 at Central Arkansas W 27-21 NAIA Quarterfinal Conway, Ark. Nov 17, 1990 at Grand Valley State W 20-14 DII First Rd Allendale, Mich.
Nov 24, 1990 at Pittsburg State L 28-60 DII Quarterfinal Pittsburg, Kan.
Nov 30, 1991 at Pittsburg State L 28-38 DII Quarterfinal Pittsburg, Kan.
Nov 18, 1995 at Portland State L 35-56 DII First Rd Portland, Ore.
Dec 13, 2013 vs. Harding L 3-44 Live United Bowl Texarkana, Ark. Nov 21, 2015 at Ferris State L 30-48 DII Regional Qtr Big Rapids, Mich.
Nov 26, 2016 at Grand Valley State L 32-55 DII Regional Semi Allendale, Mich.
Nov 18, 2017 at Winona State W 20-6 DII Regional Qtr Winona, Minn.
Nov 25, 2017 at Central Washington W 34-31 (2OT) DII Regional Semi Ellensburg, Wash.
Dec 2, 2017 at Minnesota State W 31-21 DII Regional Final Mankato, Minn.
Dec 16, 2017 vs. West Florida W 37-27 DII National Champs Kansas City, Kan.
Nov 7, 2018 at Minnesota-Duluth —- DII Regional Qtr Duluth, Minn. The Lions are 5-3 in overtime games all-time. 1951 – The Lions trek to San Marcos and earn a 28-21 LSC win over Southwest Texas. 1956 – Southwest Texas is a 14-0 victor over ET in Commerce. 1962 – ET closes out the season with a 39-6 rout of Stephen F. Austin in Nacogdoches. 1973 – The Lions end the year on a four-game win streak with a 42-13 road victory at Tarleton. 1979 – ET’s season ends in a close one, with a 20-19 road loss at Angelo State. 1984 – The Lions’ season closes with a 24-14 home loss to Abilene Christian. 1990 – The Lions win their first NCAA Division II playoff game in their first appearance, taking down Grand Valley State, 20-14, in Allendale. The Lions took a 7-6 lead and didn’t trail again. Gary Perry had a rushing TD, Bob Bounds completed a 35-yard TD pass to Gary Compton, and Billy Watkins kicked field goals of 42 and 35 yards. Eric Turner, Steve Peters, and Terry Bagsby had interceptions. Linebacker Mick Still helped rescue a Grand Valley alumnae from an attack the night before the game, then was named USA Today Defensive Player of the Week with an 11 tackle performance. Kotlik earns Second Team All-Region honors from D2CCA. 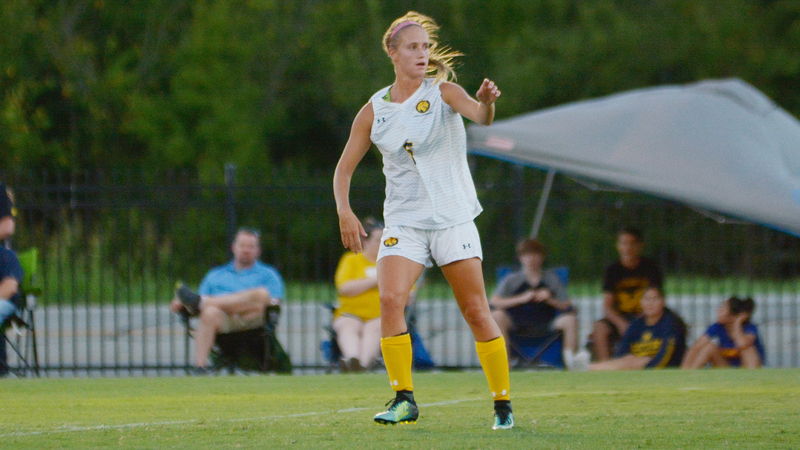 CANYON– Texas A&M University-Commerce midfielder Michelle Kotlik has been named to the Division II Conference Commissioner’s Association All-Region team. The All-Region teams were announced on Wednesday. Kotlik– a senior from Grapevine– earns her second All-Region honor of the year after being named Google Cloud Academic All-District. Kotlik was named the Lone Star Conference Academic Player of the Year and First Team All-Conference and had a stellar season for the Lions. She played in and started 16 matches, scoring a career-high six goals, with three game-winners. She also had an assist and had 13 shots on goal. She finished sixth in the LSC in points, fifth in goals scored and fourth in game-winning goals. Kotlik has been named All-Region by the D2CCA in three consecutive seasons. Also, during the 2017-season she was named First Team All-Region by the USC and was named the LSC Midfielder of the Year and a First Team All-LSC selection. During the 2016 season, she was named Second Team All-Region by both the D2CCA and the NSCCA, as well as a second-team All-LSC selection. GK Shannon Mooney Colorado Mines Jr. Broomfield, Colo.
D Cheyenne Orozco West Texas A&M So. Rio Rancho, N.M.
MF Anna Gregg UCCS Sr. Sacramento, Calif.
MF Tarah Patterson UCCS So. Colorado Springs, Colo.
MF Nicole LaTourette Colorado Mines Jr. Tualatin, Ore.
F Jennifer Kendall Colorado Mines Sr. Bloomfield Hills, Mich.
F Grace Linton Newman Sr. Wichita, Kan.
F Regina Banks Metro State Sr. Bakersfield, Calif.
GK Nicole Rahman Dixie State Jr. Palos Verdes, Calif.
D Aleesa Muir UCCS Jr. Colorado Springs, Colo.
D Hanna Parado UCCS Sr. Ponte Verda, Fla.
D Kyra Butler Newman So. Rapid City, S.D. F Hannah Kelley-Lusk West Texas A&M So. Farmington, N.M.
F Whitley Johns Dixie State Fr. Gilbert, Ariz.
F Colleen Howland Newman Sr. Wichita, Kan.